Willow: It's Hard to Keep a Secret When It's Written All over Your Body... - Lis Les Livres- Read Books! 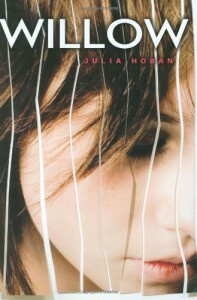 http://lisleslivres.blogspot.com/2012/11/review-willow-by-julia-hoban.htmlStayed up til 5:00 AM to finish it...needless to say I LOVED IT!Characters: Julia Hoban does a great job of developing these characters. Willow was someone who put up walls of protection, not wanting anyone to be let in, utilizing isolation and a little bit of sarcasm to keep people away. However, it is obvious that she still cares about her brother, niece, and others, and I couldn't help but feel for her. As for Guy, he needs to help Willow because that is the way he is. He was such a sweetie. I wish I had my own Guy to always be there by my side, although I hope this guy isn't named Guy because I hate that name. Haha.Their relationship definitely had some awkward moments like all relationships do, and Hoban realistically demonstrates this. I very much admire the way that she had the two protagonists grow as their relationship simultaneously did.Plot: It was totally predictable. I don't know what kind of stories are original these days. It seems like everything has already been done.Writing: *Warning* If you are squeamish, you will have to utilize the super rapid page flip, made famous by moi, when you get to the descriptions of Willow cutting herself.Would I recommend this to a friend? YES! I told you, I stayed up until 5 to read this. If you like romantic dramas, read it!